Last month our building had a holiday apartment crawl inspired by the book, The Selby Is in Your Place . Going in & out of your willing neighbours apartments to hang out and get neighbourly with just the appropriate amount of snooping is actually super fun. Making crafts, listening to someone play the piano or decorating Christmas cookies at each stop is even better. For our stopover, we made vintage cocktails for everyone (strong boozy drinks are always a charmer) and of course I made snacks too. Somehow after drinking a bit too much mulled wine at previous apartment hops I forgot that I had a plateful of devilled eggs in the fridge to serve alongside the cocktails. No matter because I did not forget about the cheese straws. Cheese Straws people!! These get the capitol letter treatment because, my god, they were really freakin’ delicious. Not to mention ridiculously easy to make too. See that cheese? That’s the good stuff. Premium aged Cheddar. Five year old, award winning cheese. Hooray! If you need a nudge to get a food processor, let this be the recipe to convert you. It’s kind of amazing how easy these were to pull together. Just a whizz-bang of flour, cheese, butter, aleppo pepper and milk and the dough is ready to roll. Ideally, the key to perfect straws is to roll out a perfect rectangle. I’m not sure how one does that (see above). Perfectly shaped cheese straws? Who needs ’em. My homey, rustic cheese straws were amazing as is, thank you very much. Use the squat, ragged ends as “testers”. Or just serve them. Trust me, no one will mind. The real magic happens when they bake. Thanks to all that butter and cheese, don’t just end up golden brown and crispy, but they’re also quite puffy and light! These crackers are a class act all the way. Let’s recap. Puffy, easy to bake, cheesy and a hint of spice. Serve them in mason jars! These will disappear quickly so you might think about making another batch. Whatever party or gathering you make them for will be better off because of it. elsewhere: Check out Poppytalk this week for my recipe for a quick pasta & lemony brussels sprouts dish. It’s a perfect weeknight meal. 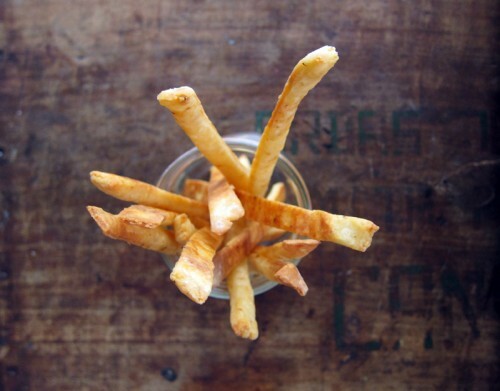 Use a really good extra sharp Cheddar cheese for these. Using your standard waxy Cheddar isn’t going to cut it. Go for the good stuff. 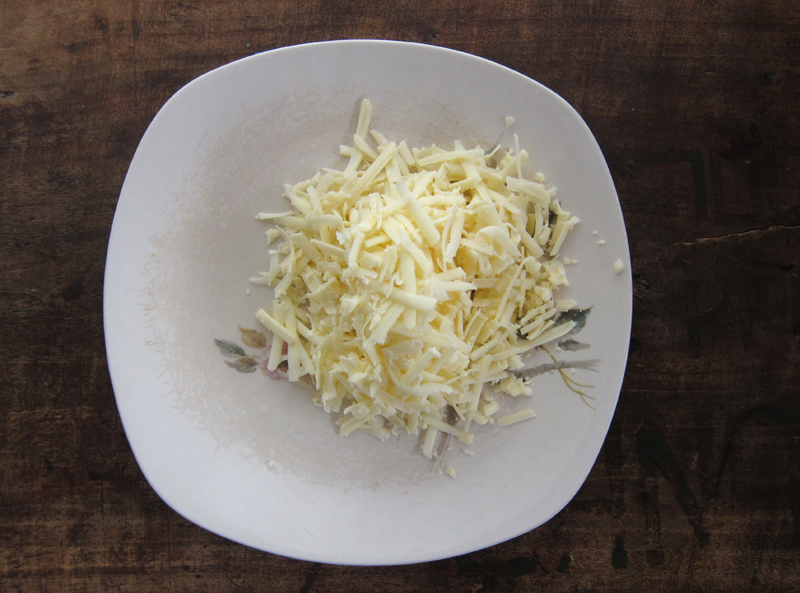 In a food processor, combine the cheese, butter, flour, salt and red pepper in quick 5-second pulses until the mixture resembles coarse crumbs. Add in milk and process until the dough forms a ball, about 10 seconds. 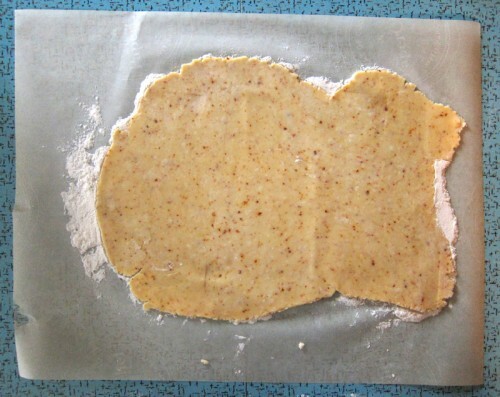 On a lightly floured surface, using a lightly floured rolling pin, roll the dough into an 8×10″ rectangle that is 1/8″ thick, or there abouts. 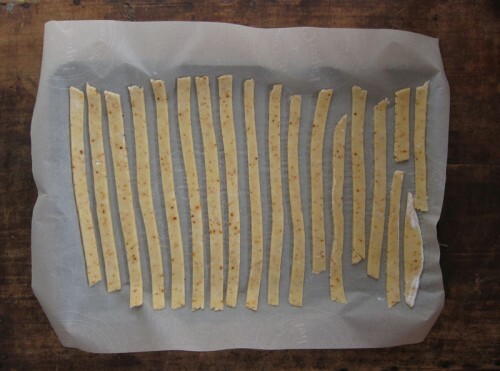 With a sharp knife or pizza wheel, cut the dough into 1/4″ to 1/3″ wide strips. 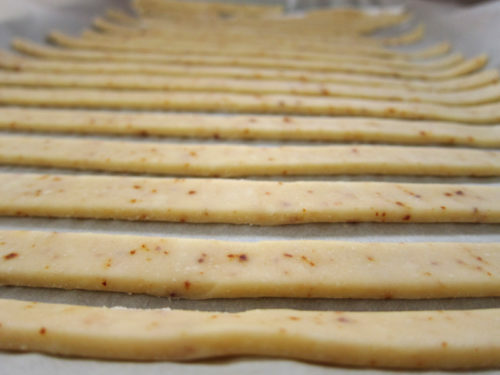 Gently transfer the strips to a silpat or parchment lined cookie sheet, leaving at least 1/4″ between each straw. You’ll have an assortment of different height straws which is all part of the charm. If some break during transferring to the sheet, that’s okay too, just do your best. Bake the straws on the middle rack for 12 to 15 minutes, or until the ends are barely browned. Remove from the oven and set the cookie sheet on a rack to cool. Serve at room temperature. You can keep these in the fridge, but why bother, they’ll be eaten immediately. Guaranteed. Yum! I love cheese straws. They would be perfect with boozy cocktails (is there any other kind?). What a fun christmas open house idea! Sounds like you live in a great building! These are so fun! The perfect party finger food. Oh my gosh, I love these things! And it sounds like a lovely party. I hope to live in a place where I can have a party like that someday. Yes, go for it, Eileen. I resisted the lure of a FP and now use it often. Bijoux, these are very dangerous. Make them for a crowd! Joanne, agreed. Perfect party fare. I wish i was having people over tonight, instead of having to go some where. This sounds perfect and delicious… with some yummy cocktails… the real kind. My new fave is an Old Fashioned! i use the smitten kitchen one and usually make small cut out stars. they are amazing for kids birthday parties. Oh man!! This might put me over the edge. I’ve been coveting a food processor for over a year now! This recipe is too hard to pass it. I love it rustic too, who cares of them all matching? Home-made cheese crackers of any kind are where it’s at! They are so freaking tasty it’s ridiculous, and they never fail to blow people’s minds. Thanks for the reminder! Piper, I love old Fashioned’s! For our night, we made The Last Word. But this past Friday, I made a delicious blood orange Manhattan. Yum!! 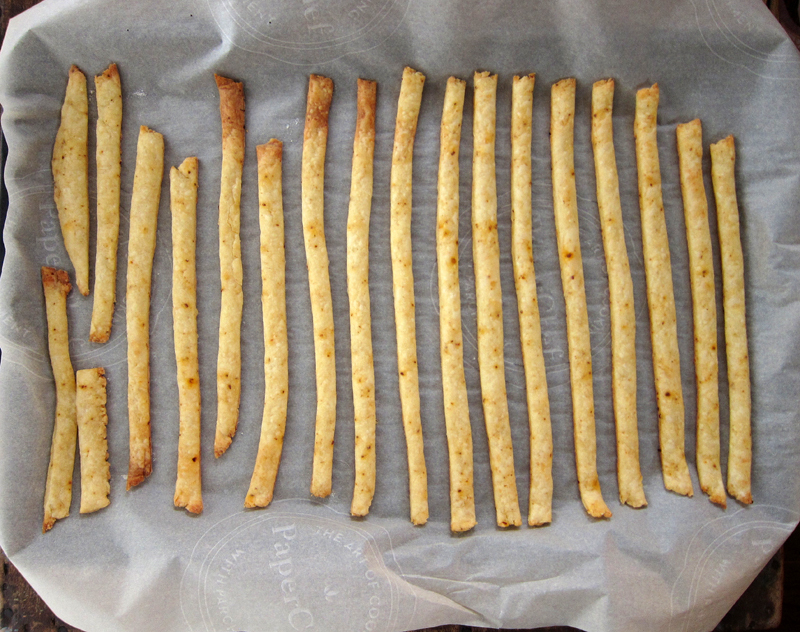 I wish I had more of these cheese straws to nibble on! I love the idea of cutting them out into shapes, Danielle. Stars are awesome! Fun idea. Yes, totally mind blowing, Sarah! I hope you make ’em. Oh man, your apartment stop must have been the best! That is such a fun idea. Boozy vintage cocktails and cheese straws! I’ve been meaning to make these for years. I think Deb adapted them from The Lee Bros Cookbook, which I own and love, but have to dig back into. I’m glad you loved them so. A perfect pairing with cocktails! 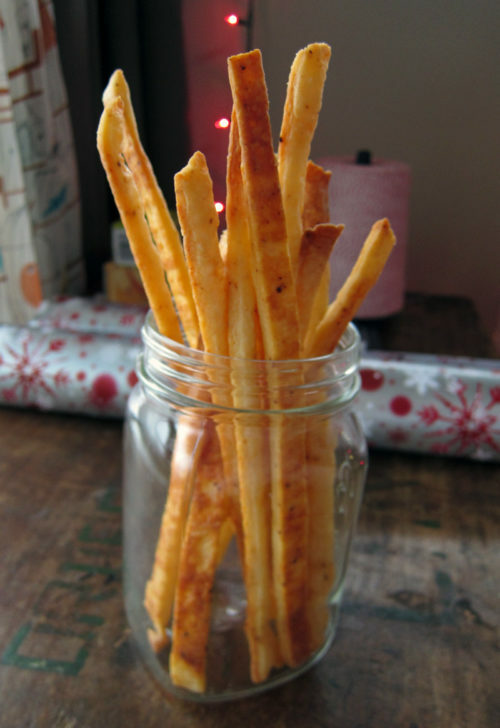 I love Cheese Sticks/Straws and so do my kids and now, I will definitely use your recipe to make some for them. But what I really love is the photography that you have provided along with this post. The apartment obviously tells a beautiful story! Well done. Nicole, I’m so happy we’re in such a great building! So much fun. I’m going to have to check out that cookbook. Sounds like a keeper.